Cyberbullying is the intentional and repeated mistreatment of others through the use of technology, such as computers, cell phones, and other electronic devices. On Sunday, Feb. 23, Roberta S. Clark, the Community Director of the Anti-Defamation League (ADL) and the recipient of the 2013 FBI Director’s Community Leadership Award, delivered a special presentation on cyberbullying. Her message comes at a time when approximately 20% of young people report a problem with cyberbullying at some point in their lives, according to a 2010 study from the Cyberbullying Research Center. The ADL website provides powerful statistics on cyberbullying that reveal just how prevalent and urgent the issue has become. In a study of 500,000 third to 12th grade students, 17% reported being bullied at least 2-3 times in the last month. In a survey of 655 teens from 13- to 18-years-old, approximately 1 in 10 reported themselves as the aggressor, having cyberbullied someone online or by text message. Even more shocking, perhaps, is the rate of bystanders who do not intervene. In a study of classroom behavior, children and youth were present during 85% of bullying episodes, but stepped in just 10% of the time. There are, however, solutions to these problems. Statistics show that allies who speak out on behalf of someone else or take actions that are supportive of someone else are able to halt more than half of all bullying behaviors in less than ten seconds. The ADL suggests being an Upstander instead of a bystander by taking a few simple steps in order to stop and prevent bullying whenever it arises. Whether or not you know the person who is the target of bullying, it is important to show compassion by asking if they are okay, going with them to get help, and making sure they know they are not alone. Another way to be an ally is to not participate. Choose the high road and let people know by your behavior that bullying is not right. And when confronted with a bullying situation, don’t be afraid to speak up. Tell aggressors to stop or inform a trusted adult if you need help dealing with the problem. The ADL provides education and resources online for both children and adults. 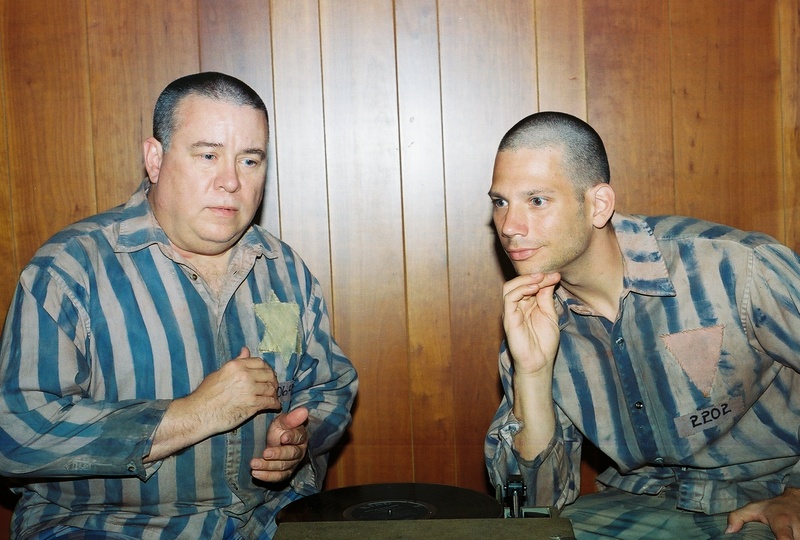 Actors Karl Lewis (Benjamin) and Jeremy W. Smith (Hans) bring an often forgotten story of the Holocaust to the stage. What divides us as human beings should not be stronger than what unites us. Yet, history is filled with examples where differences, especially in matters of truth and justice, have produced tragic results. Conflict over what we share in common—and who we are as individuals—well, this is the stuff of compelling stage drama. Make the setting a World War II concentration camp during the Holocaust, at a Holocaust Museum, and the drama is groundbreaking. Such is the case with The Timekeepers, a limited-run play now at the Dallas Holocaust Museum Theater on select nights through June 22. The subject matter is strictly for adults. Tickets are available online. Directed by veteran Texas artistic director Joe Watts, The Timekeepers tells the story of a young-ish German homosexual and a conservative elderly Jewish man who are forced to work together in a camp, repairing watches for the Nazis. At first, inmate #70649, a character named Benjamin played by veteran Dallas actor Karl Lewis, who wears a yellow star on his camp uniform, won’t even speak to his new colleague. Hans, inmate #2202, whose pink upside down triangle brands his character, played by actor Jeremy W. Smith, a SAG member with television credits, takes the rejection in stride, as though accustomed to it. Fomenting—and sometimes mediating—the relationship is Capo, a petty thief and camp inmate who oversees the watch repair shop, played by actor Eric Hanson, who makes his debut theatrical performance in the production. Benjamin was a highly regarded watchmaker in Berlin prior to his deportation. He is expert at repairing watches that Nazi guards confiscated from new camp arrivals. Hans lied about his mechanical abilities—he knows nothing about repairing watches—to avoid certain death as a failed laborer in a camp cement plant. As is often the case in life where obvious differences overshadow commonalities upon initial meetings, time and humor eventually washes away prejudice and indifference and the two men discover each has a passion for a shared interest: opera. The two men become friends and even rehearse scenes from an opera that they will perform at a show for the Finnish branch of the Red Cross who will be visiting the camp in a few days. However, when the show is suddenly cancelled, their common passion for opera instantly disappears and pride and prejudice overtakes each again and erupts in a raw, disturbing, enlightening and all too familiar scene from daily life even today. To say more about the play by Dan Clancey would spoil an incredibly impactful production by Theatre New West. In introducing the play, truly a first-of-its-kind production for the Dallas Holocaust Museum/Center for Education and Tolerance, President and CEO Mary Pat Higgins noted how the Museum is committed to telling the stories of all Holocaust victims. The play continues Fridays and Saturdays, June 14, 15, 21 and 22 at 8 p.m. Talk back sessions with the director and cast will occur after Friday night performances. Are You an Upstander Every Day? By now, you have probably heard of Karen Klein, the New York school bus monitor mercilessly bullied by a crowd of 12-13 year old boys on a school bus. As the boys continued to torment Klein she remained calm and did not retaliate, at one point telling them that if they didn’t have anything nice to say, they shouldn’t say anything at all. After word of this incident got out, a complete stranger set up a fundraising site that has raised over $600,000 to date so that Klein could go on vacation and feel a little of the kindness that she could have used that day on the bus. In reading this story, the classic roles are easily seen: the bullies/perpetrators, the victim, and the bystanders (all those students who were clearly within hearing range, but did nothing). Who is missing? The Upstanders. Those people who are often called heroes, champions of causes, doers of good. Where were they? No doubt about it, many of us feel that if we were there, we would have done the right thing. We would have made it stop. Unfortunately, we have all had chances to be an Upstander that we let pass us by. Whether it was ignoring the girl everyone made fun of in school or joining in heckling a fan of an opposing team for wearing the wrong jersey to the game. She’ll be fine. He deserves it. Sticks and stones, right? Wrong. It is in these every day instances that we have a chance to shine. Bullying is everywhere, and it doesn’t take much to see it happening. It doesn’t take much to stand by, or even to join in, really. It takes more to stand up and say, this is wrong, we’re better than this. No one deserves to be attacked verbally or physically just for being in the wrong place at the wrong time. When we stand up for these unfortunate folks, we make their world a better place, even if just for a moment. And sometimes a moment is all it takes to change someone’s world. How is it that Asian Americans are the Most Bullied and Abused Ethnic Group in America? I am a woman of African-American and Native American decent. 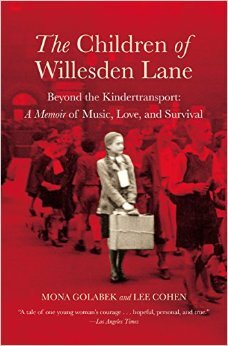 I am also director of marketing at the Dallas Holocaust Museum/Center for Education and Tolerance where the study of Jewish history and the Holocaust have become a passion for me. Because of this background, you might think I am desensitized to the incivility and inhumanity that human beings can heap upon on one another. Desensitized? Not at all. I watched as discrimination and bullying destroyed my father’s spirit. I have listened to the horror stories of my Native friends who talk about the rapes and kidnappings of children by non-Native people which still occur on reservations today. Despite my knowledge of the realities of racism and bullying, I was floored to learn that Asian Americans experience more discrimination, bullying and intolerance than any other ethnic group in the United States. According to Jeff Yang who writes for the Wall Street Journal, “young Asian Americans are facing a bullying epidemic. Last year the U.S. Departments of Justice and Education released a joint study showing that over half of Asian American teens said they’d been the subject of targeted abuse at school, versus approximately a third of blacks, Hispanics and whites.” AAPI Nexus reported that Asian American students are bullied in American schools much more than students belonging to any other ethnic group. My mind is full of questions. What? How? Why is this happening? Let’s start with “what” and “why”. According to Yang, Asian Americans are disproportionately targeted for abuse due to their real or perceived “social awkwardness, physical frailty and academic overachievement…” He adds that there is a rising tide of animosity toward immigrants and to those who look different. Many Asian Americans are also misperceived as being predominately Muslim. Why didn’t I know this was happening? I knew that anti-Semitism is once again on the rise. I know first hand that the election of Barack Obama did not usher in a renewed acceptance and understanding of African Americans. The problem is that targeted bullying of Asian Americans goes largely unreported. Yang writes, “cultural and familial expectations push [children of immigrants] to submit to bullying” and they suffer in silence. Their silence in the face of bullying has its consequences: “over the last ten years, depression rates among Asian Americans have skyrocketed.” Suicide is now the fifth most common cause of death among Asian Americans. One such suicide caught international headlines recently—Private Danny Chen killed himself after allegedly facing considerable bullying and abuse by his fellow soldiers while based in Afghanistan due to his Chinese heritage. All bullying is wrong, no doubt about it. But the fact that these victims are suffering silently is a tragedy. Now that I know about this tragedy, I’m going to tell others…and that’s just a start. Bullying is everywhere in the news today. From tragic stories of suicide to triumphant tales of kids who have overcome the challenges bullies provide, this is definitely an issue worth talking about. 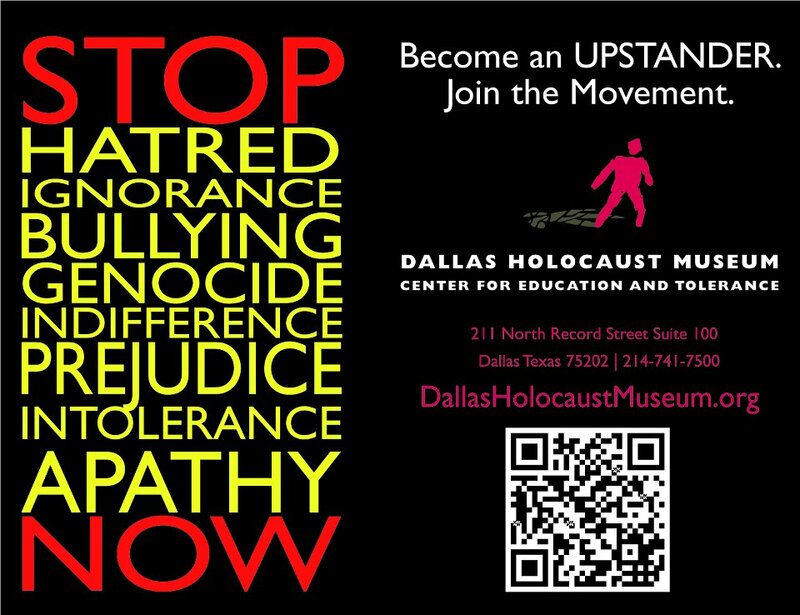 At the Dallas Holocaust Museum/Center for Education and Tolerance, we know that bullying is just the first link in a chain of negative actions that can lead to the unthinkable. It is so important that we all become Upstanders whenever we see bullying around us. Together, we can keep bullying from becoming something more sinister.